Visual:Drumset An installation that augments the purely acoustic experience of a drum solo with interactive and reactive visuals, using the drumheads as a canvas for generative art. It has been awarded the Golden Nica in the category 'u19 - Create Your World' at Prix Ars Electronica 2013 and is currently in the exhibition of the Ars Electronica Center in Linz, Austria. Previously, it has been exhibited in Dresden at the mb21 Festival 2013 and at the Ars Electronica Festival 2013. The project underlines a seamless connection between Digital and Analogue, rather than one replacing the other. 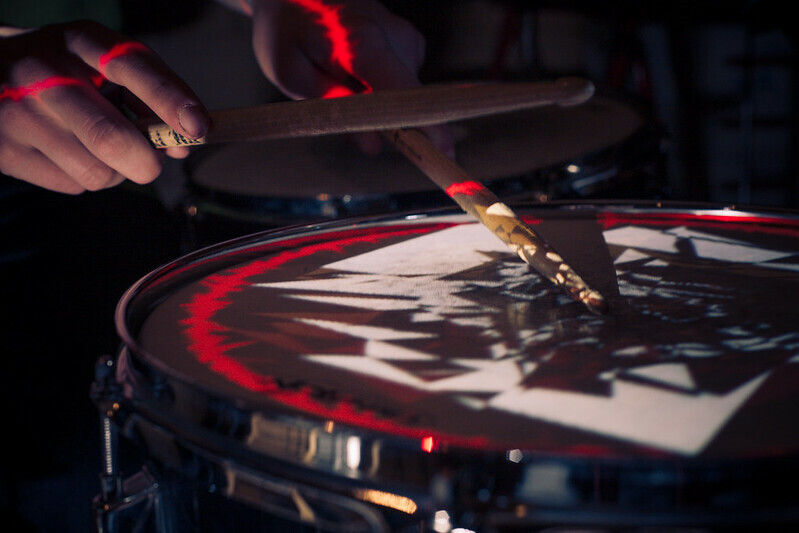 Visuals projected onto each drumhead react to every drumbeat, intuitively augmenting the purely acoustic nature of the drums. Depending on the settings, bass drum beats may also interact with the visuals. Cymbals can also be used both as trigger (with electronic cymbal triggers) and canvas, using white cymbals. 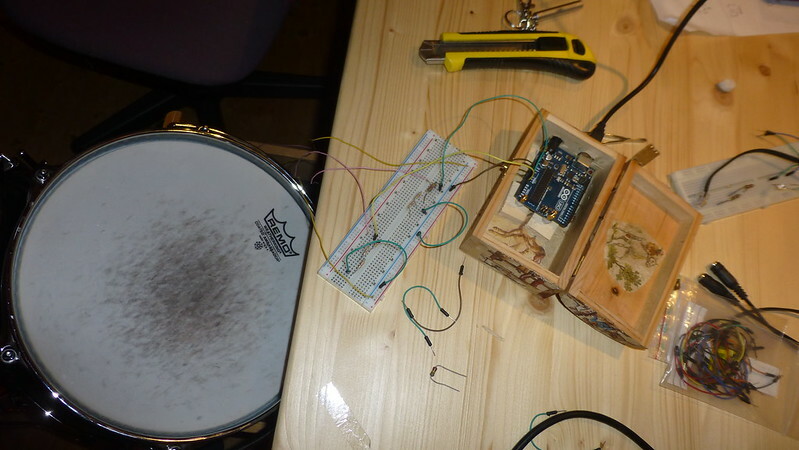 The Hardware used is an Arduino (open-source programmable development board), connected to vibration sensors on each drum to measure the intensity of each hit. The Arduino is programmed to forward any data collected from the sensors to a connected computer. The software has originally been developed using the open-source programming language Processing; the latest version is written in vvvv, a hybrid visual/textual programming environment. It establishes a connection with the Arduino, which provides real-time data from each sensor. 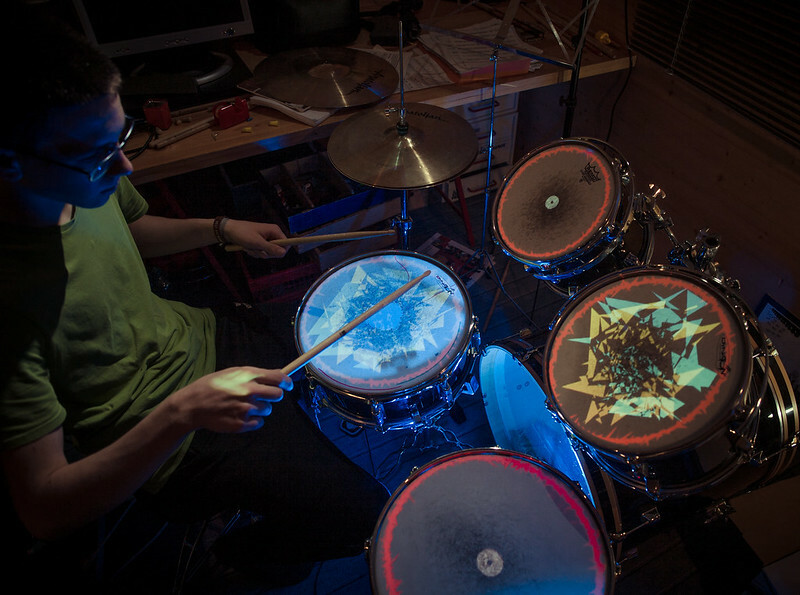 Using projection mapping, a technique for projecting images onto three-dimensional objects, visual effects are projected onto each drumhead, reacting to the data coming from the Arduino. The visuals themselves are extremely adaptable, ranging from simple light intensity changes to particle systems that seem to ‘explode’ when the drum is hit. In this way, Visual:Drumset creates an audiovisual, reactive experience for both the drummer and the audience.